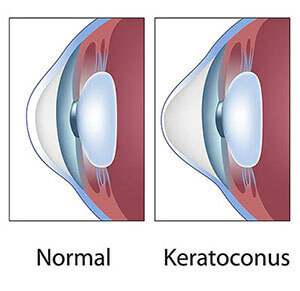 Keratoconus is a condition where the cornea becomes thin, stretches and bulges forward, forming the shape of a cone. The causes for this condition are related to a number of factors including heredity, constant rubbing of the eyes, and may develop as a result of other diseases. The symptoms of keratoconus are poor vision and occasionally pain and tearing. The cone-shaped cornea has the ability to produce mild to severe astigmatism. The symptoms often develop at a young age and gradually become worse over time. The issue can resolve on its own, but scarring may occur and lead to a decrease in vision. Keratoconus can be treated in its earliest stages with glasses or contact lenses. As the disease develops and worsens, a corneal transplant may have to be performed. Less invasive procedures include Intacs, which are tiny rings placed on your cornea and may be used with Conductive Keratoplasty to help improve vision.